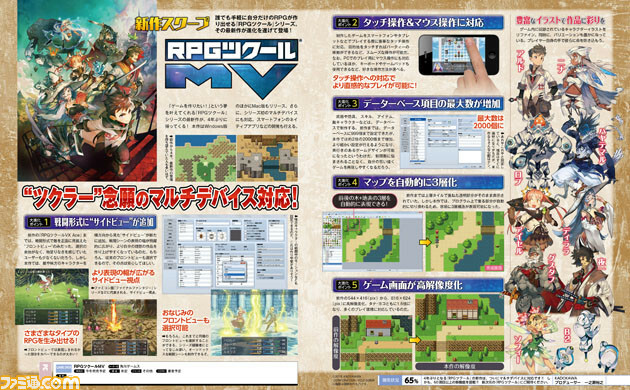 The do-it-yourself RPG maker series is getting its latest entry with RPG Maker MV, a preview for this week’s issue of Famitsu magazine confirms. While details are still light for the time being, the scan shows that RPG Maker MV will be supported by multiple devices. It will also have side-view battles, mouse and touch screen controls, a larger database, and three-layered map. 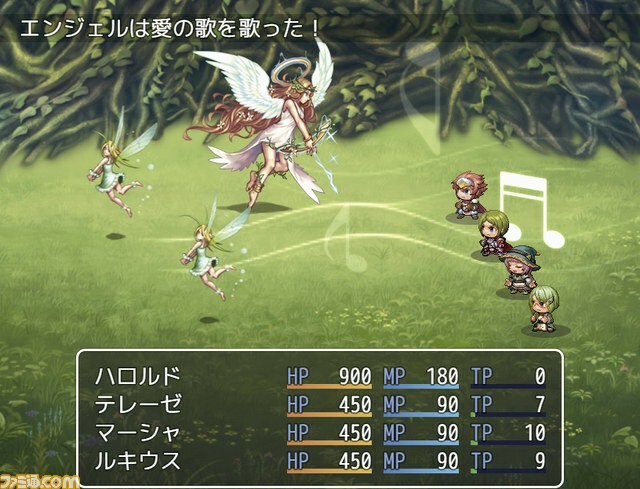 RPG Maker MV is in development for PC and Mac. Going back to layers for mapping is awesome, and it's nice to see they're finally bringing back sideview battles as a default. That's pretty rad, hopefully it will be a step up from VX like it was to XP. VX to VX Ace added a lot of new features but at the end of the day it was still the same program. I'm hoping they keep RGSS3. I don't want to have to wait for all new scripts again. .-. Highly doubtful considering the huge changes each version has brought (except for VX > VXA). Personally, I hope they move to Ruby version 2 and make RGSS4. We'll be doing a bunch of script porting, but I'm sure the new version will be awesome. D-Did I see side-view battles being a main feature again...? I honestly didn't think there would be another. It looks like they've mixed the layers with the shadow stuff from vx/vxa. It looks like, if you have some on the top layer, and nothing in the middle, it will cast a shadow. uhhhhhhhhhh are they keeping the same rtp graphics? ._. They kind of did with vx to vxa. I really hope it get's a lot of improvement, like animation frames as many as someone likes to have. Then Pixel Movement, with pixel precise collision boxes. I also hope, you can make real mini games. Like a jump'n'run mini game and the normal game is a RPG or Action RPG. Possible with the GG Maker on Steam. Can't wait to pirate this. 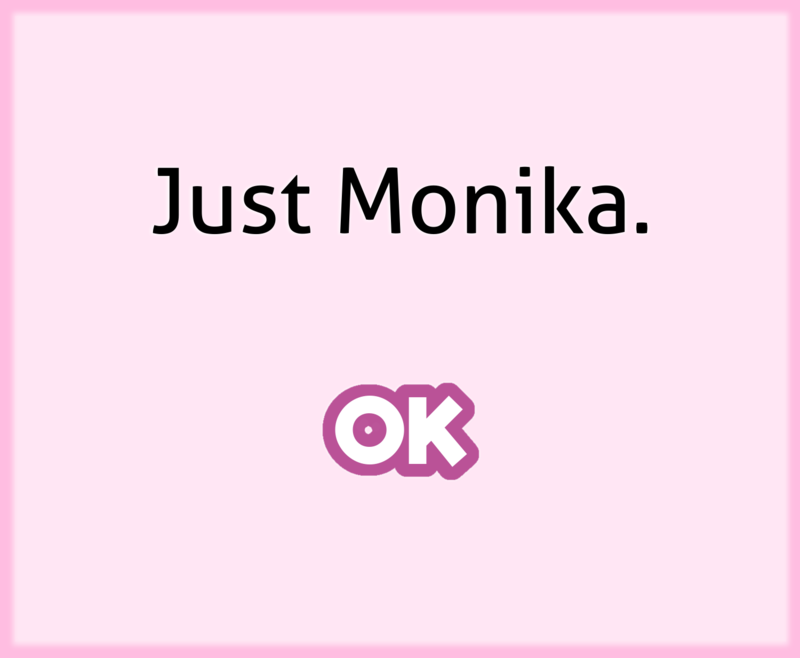 Better not talk about that. But I really hope they improve. Because it will be for sure another 60€ and for the same amount you can get GG Maker, which has a lot of options. 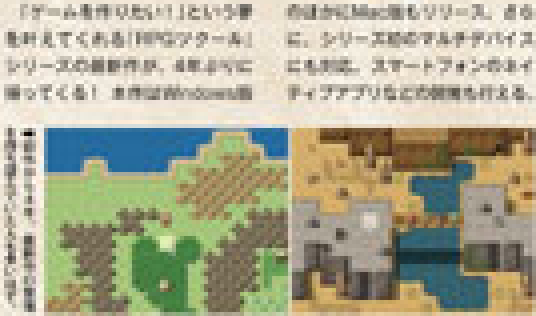 Scanned pages from Famitsu and a brief summary of features has been released. Also, larger pictures from development. It appears that character sets and so on are being increased in size (x1.5). Sprites and tilesets will be 48x48. why do you keep doing this enterbrain? 544x416 isn't a real resolution. So at 48x48, what is the resolution going to be, something like 816x624? 960x720? Games running at 720 would be pretty cool. You can back and forth from front or side view battles? Nicely done. Yeah, the new resolution will now be 816x624. So basically no current VX-type tileset will work in MV unless there is a backwards compatibility mode. EDIT: I really hope the character generator outputs side-view battlers. That would be neat (and time saving). Three Layer returning, Bigger sprites, side-view battles returning. 2016 . . . time to get back to game making when it comes out!!! I'm looking forward to seeing what else there is. I hope it's easy to pirate when it does come out. Then a few years from now I hope it goes on sale, or is in a humble bundle. Page created in 0.673 seconds with 26 queries.